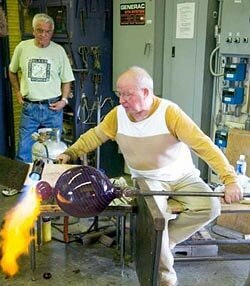 Glass art is coming back in style again. There are glassworks in Switzerland, Sweden, Brazil, and many other places. But there was a time when the trade of glassblowing and glass art was dominated by the Venetian Republic, with the factories on the island of Murano. What made Murano's glassmakers so special? For one thing, they were the only people in Europe who knew how to make a mirror. They also developed or refined technologies such as crystalline glass, enameled glass (smalto), glass with threads of gold (aventurine), multicolored glass (millefiori), milk glass (lattimo), and imitation gemstones made of glass. Their virtual monopoly on quality glass lasted for centuries, until glassmakers in Northern and Central Europe introduced new techniques and fashions around the same time that colonists were emigrating to the New World. Today, Murano is still an exporter of traditional products like mirrors and glassware, and its factories produce modern items such as faucet handles, glass lampshades, and electric chandeliers. At the retail level, there's a growing emphasis on art glass and the souvenir trade. Visit the ubiquitous glass shops on Murano or in Venice, and you'll find countless paperweights, glass beads and necklaces, knickknacks, and items of glass jewelry. Some are amusing: e.g., colored fish in transparent glass aquariums, or wrapped hard candies of multicolored glass. Others are pretty; glass necklaces and beads, for example. "The Venetians still profess to find Murano glass lovely, but sophisticates in the industry, if you manage to crack their shell of salesmanship, will admit that bilious yellow is not their favorite color, and agree that one or two of the chandeliers might with advantage be a little more chaste." To be fair, Murano's artisans do produce stunning works of contemporary art from glass, although some of the designs are by foreign artists. Visit a Murano glassworks such as Linea Valentina, and you'll find works that are technically fascinating regardless of whether they appeal to your personal tastes. Many glass factories offer free walk-in tours on Murano, so you can watch glassblowers do their thing even if you've maintained your independence by taking public transportation. Don't miss the Museo Vetrario located in the Palazzo Giustinian near the island's center. The museum has a collection of glass from Egyptian times until today, and the displays show how the art and manufacture of glass developed over the centuries. Reach Murano by boat from San Zaccaria, just up the Riva degli Schiavoni from St. Mark's Square in Venice. You can also board the waterbus at several other stops, including the Fondamente Nuove station on the lagoon side of the Cannaregio district. The boat ride to Murano takes less than 10 minutes. You can get off the boat at any stop on the island, but the Museo stop is most convenient to restaurants, stores, and sightseeing. There are a lot of color photos here that will satisfy any glasswork fanatic. It's a tiny little book, smaller than a paperback novel, but there's a lot of information here. Just don't go into it thinking this is going to be some scholarly paper with tons of citations. 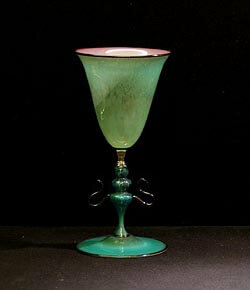 It's a popular history with the goal in mind of making people more interested in Murano glass. Murano Magic: Complete Guide to Venetian Glass, Its History and Artists This is not just a coffee-table book. Iit's an encyclopedic guide, exhaustively researched and engagingly written. Murano Magic will make you see the city and its art with new eyes and a deeper appreciation. Recommended to anyone, but especially to those who are planning a trip to Northern Italy. Last updated by jack on 19 February, 2010 in Travel.